Illinois State students talk at a reception hosted by the Graduate Student Association on April 10 during the University Research Symposium. Kody Frey and Erica Johnson have a lot in common. They both grew up in North Carolina—only about an hour and a half away from each other—before choosing Illinois State for graduate school. But they never would’ve met without the Graduate Student Association (GSA), a registered student organization that’s making a big comeback at Illinois State. In fact, Frey and Johnson both became GSA leaders in part to meet students from other programs—a big challenge for many grad students. Through social events and advocacy on behalf of grad students, Frey, Johnson, and other GSA members have built bridges between academic programs spread out across our decentralized campus. 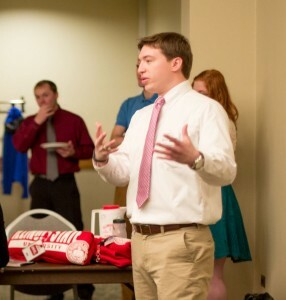 Outgoing GSA President Kody Frey talks at the reception on April 10 during the University Research Symposium. Johnson spends almost all of her time in Turner Hall, where she’s one of just three grad students in the human development and family resources program in the Department of Family and Consumer Sciences. “We’re so immersed in our teachings and learning that we forget that there are people outside of our departments who are thinking and studying differently than we are,” said Johnson, GSA’s secretary. There are 2,460 graduate students at Illinois State, around 12 percent of the total student body. But that smaller population has some unique needs that require special advocacy, Johnson and Frey said. That’s what led to the re-launch of GSA in winter 2014, after the organization’s predecessor had gone dormant. In addition to representation on the Graduate School’s Graduate Council, Frey and the executive board spent the past year lobbying for a senate seat in the Student Government Association (SGA). 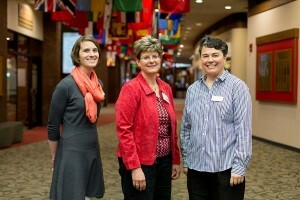 Graduate School Director Amy Hurd, right, the Graduate School’s Kim Shennett, center, and Research Symposium graduate assistant Lindy Manuel. Their hard work paid off: Obinna Olajide Mogbogu was elected this spring to SGA’s senate as a representative of graduate students. Frey hopes GSA regains a second senate seat in the future. Another highlight was a reception GSA co-hosted with the Graduate School during the University Research Symposium on April 10. Social events like that allow grad students to swap stories about their own unique experiences working with faculty, teaching undergraduates, or doing research. Frey and Johnson praised the Graduate School for helping re-launch GSA every step of the way. “This is just our first year, so we’re still building and we’re still learning,” Johnson said. GSA’s new executive board was elected April 21. Frey and Johnson are both graduating in May; Frey is headed to the University of Kentucky to pursue his Ph.D., while Johnson is looking for a child advocacy position. Learn more about other organizations specifically for graduate students.